If you're new to Indianapolis, moving to Indianapolis, or just looking for something new to do in Indy, you can't go wrong with the First Friday Art Tour. 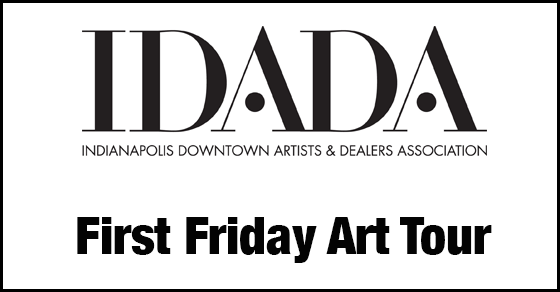 The event is organized by the Indianapolis Downtown Artists & Dealers Association (IDADA), a non-profit membership-based organization of studio artists, art galleries and arts-related businesses within the 20 block square of the center of Indianapolis. First Friday Art Tour is a self-guided tour around the Indianapolis downtown area that is free and open to the public, and it is always new and changing (they have a neat interactive Google Map here so you can see what is featured on the tour). Most venues open their doors around 6pm and close around 9pm, or later in some locations. It's an open do-it-yourself tour, so there's no specific start location or end location—you're free to wander into whichever galleries and studios you want to visit. You are in for a First Friday treat at Gallery 924. Opening in November is the new exhibition, Robert Horvath: New is Better. A large collection of the artist's new porcelain sculptures at Gallery 924 have never been seen before outside of his studio. About the exhibition: Horvath is primarily known for his high-gloss and refined, large-scale oil paintings that represent our cultural obsession with the appearance of luxury, celebrity, and consumption. In his practice, he begins with an abstract, almost other-worldly sculpture that then serves as inspiration for the resulting highly polished and detailed painting, often mistaken for a digital image. His most recent body of work explores these sculptures with greater depth and detail. Horvath has now escalated his practice of creating a preliminary sculpture by using more substantial materials. Through the use of porcelain, his sculptures have become more permanent and thus represent works in their own right instead of simply a preliminary work or reflection of the grander oil painting. Stop in for a free showing of the 2013 Heartland Film Festival Best Premiere-winning short film, "My Guide" at the Heartland office in Fountain Square! They'll have Sun King Brewing Company cans on hand, as well as popcorn, soda, wine and candy. Screenings are every 15 minutes throughout the night. While you're in the Fountain Square area and feeling the fun party vibe, check out Fountain Square Brewery. RAW Indianapolis Artists and Fountain Square Brewery are hosting a Halloween extravaganza for First Friday, with an Art-Music-Fashion exhibition. Featured Artists/ Wendi Hall, Wayne Cogswell, Sherry Polley, Samm Wilson, Rhonda Clark, Rebecca Robinson, Paul D. Best, Kevin West, Melissa Cain, Matt Panfil, Mandykae Blair, Mallory Hodgkins, Kaylyn Perkins, Julie Young, Holly Harper, Gabriel Lehmen, Eli Hart, Christina Hollering, Chris Greene, Brinton Farrand and Amy Ward. In the Harrison Gallery – Enchanters – new work by Kyle Ragsdale. In Gallery No. 2 and Hank & Dolly’s – The Reunion Project, work by Herron School of Art & Design graduates, past and present. In City Gallery – Layers – new work by Aaron Thornburg. The Raymond James Stutz Art Gallery was voted Best Indy Art Gallery "Runner Up" for 2013 in the Nuvo Reader's Choice award. They have a reception for a new exhibition opening on November 1, titled "Rooted." About this exhibition: "Nature and environment as inspiration is a very prevalent theme in contemporary art, especially when it comes to sculpture, which has an inherently direct relationship to space and surroundings.The sculpture-only show will display how artists address themes of nature and human interaction to landscape and environment. All the artists are Indianapolis-based in order to show what is going on in the field of sculpture locally; therefore the work is "Rooted" in our very own landscape of Midwestern existence." You can check out many of these exhibitions throughout the month of November, even if you can't make it to First Friday.